My friend Debbie came up a few weekends ago and we ended up at Orlando Wetlands Park. We had a great time photographing the ducks and wading birds in their breeding plumage. I’ll write more about that later. 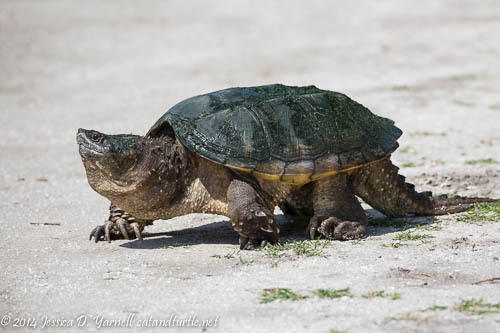 But our best find of the morning (at least, according to my turtle-loving husband Rich) was this snapping turtle. 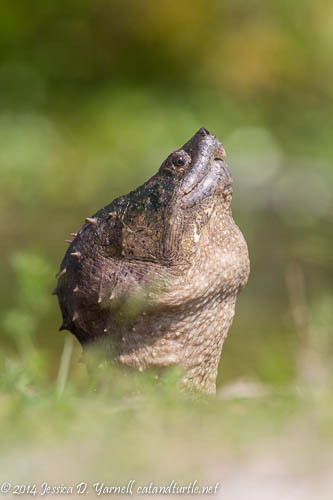 At least, I’m pretty sure it’s a snapping turtle! We first spotted him in a culvert. As big as he is, you’d think we’d have noticed him right away, but he was pretty stealthy. He climbed up on some rocks, seeming to enjoy the water rushing around them. We thought he would crawl up onto the nearby bank, but he surprised us. He instead threw himself into the current, which washed him away. I was a little disappointed not to get a good picture of him. Time passed, and we went back to photographing birds. As we got up to leave, guess what I saw? The snapping turtle was back! This time he did crawl up onto the bank. Look at him! Those big claws, the spikes on his neck, the spots on his tail! He’s the closest thing I’ll see to a dinosaur. He moved pretty fast for a turtle. He walked up the bank and crossed the path. A crowd gathered around him to gawk. He didn’t seem to mind. Oh, that was such a fun day for sure! Remember when we spotted him when we were getting ready to leave? That dang think could have walked right up to us, he was that close. How did we not see him? LOL. Great shots Jess! Looking forward to our next shoot … wonder what we’ll find that day! Rich must be in heaven with this find! This species is truly from the age of the dinosaurs.